The Yoga Practice Lab is a place to practice at practice itself. At Lab, you will further develop the skills you are learning in your regular classes, but you will also be asked to step in to your relationship with your inner teacher. I will lead and teach as I do in my regular classes, but I also show up as a fellow practitioner, in the company of other committed practitioners. The practice lab is a place of focused learning, where we practice together to share the challenges and rewards of steady dedicated work on the mat, and steady presence with our own studentship within community. I will provide the sequence and call out the poses. The sessions are asana focused, and progressively sequenced around a specific pose or family of poses. Inversions and arm balances can be expected, as well as basic pranayam or meditation. I try to share my method and process (why we’re doing this pose or that one at this stage or that stage) as well as alignment tips as we move along – I want to help you unravel and unpack the potential a deeply personal relationship with your yoga has to offer. The yoga Practice Lab is great for yoga teachers, as well as all dedicated practitioners with curiosity and a willing heart. You should have a year or two of yoga experience, no acute injures, and be ready to grow. Lab is more conversational than introspective. Self starters who understand the benefit of knowledge sharing are a perfect fit. The wide variety of poses offers a deep well of insight into the practice of Asana. The open, mutually supportive environment naturally fosters the spirit of community. 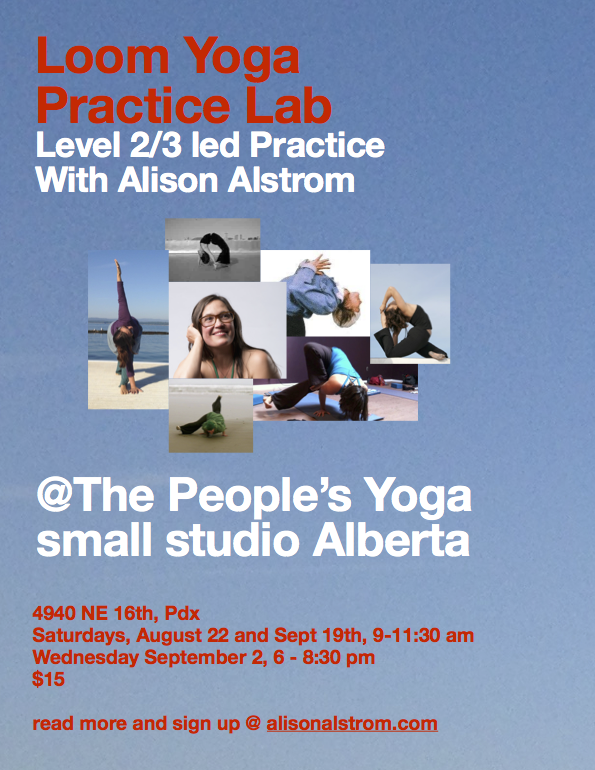 All of these dates are at the People’s Yoga small studio, 4940 NE 16th Ave at Alberta. With the exception of August 3rd, these dates are subject to cancellation up to 48 hours prior to the scheduled class time if interest is low. Sign up, and put your money where your mouth is to help insure that Lab Happens! In the event of cancellation, students will be issued a full refund. You can also bring payment to me at your regular class, or contact me for a mailing address.